A federal district judge in Washington, D.C., issued a ruling today that legitimizes the exclusion of nonbelievers from the nation's legislative chambers. U.S. District Judge Rosemary M. Collyer, a Bush appointee, ruled against plaintiff Dan Barker, co-president of the Freedom From Religion Foundation. Barker sued House of Representatives Chaplain Patrick Conroy, a Roman Catholic priest, for barring him as an atheist from delivering a guest invocation. Also named as a defendant was Paul Ryan, speaker of the House, who oversees the chaplain's office. 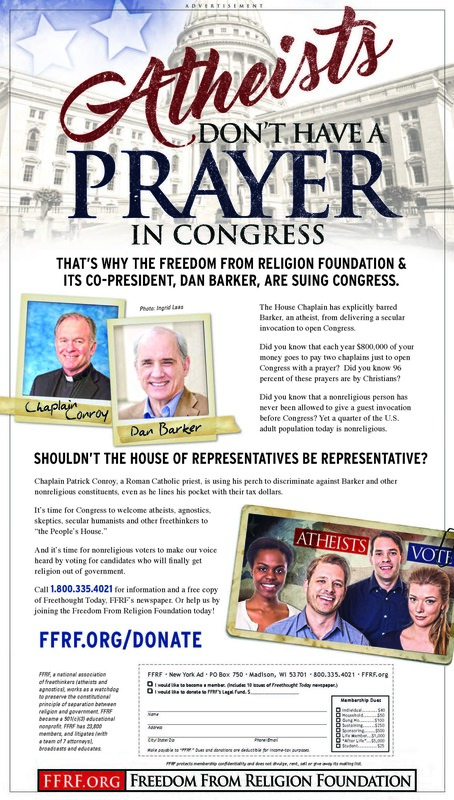 "To decide that Mr. Barker was discriminated against and should be permitted to address the House would be to disregard the Supreme Court precedent that permits legislative prayer," Collyer wrote. Although the court found that Barker was injured, and that the defendants did not have legislative immunity, she ruled that none of the defendants was ultimately responsible for that injury. The judge claimed that the chaplain was powerless to allow Barker to give the invocation, due to House rules, yet also dismissed Barker's claim against the House itself. The decision fails to identify who, if not the House chaplain and the House itself, could be sued for implementing a rule excluding nonbelievers from participation. Under her ruling, the program — in which members of the House invite a religious leader of their choice to open a session with an invocation — remains closed to community leaders representing the 23 percent of Americans overall — including 38 percent of millennials — who are nonreligious. "We're deeply dismayed that atheists and other nonbelievers are being openly treated as second-class citizens," says FFRF Co-President Annie Laurie Gaylor. "Our government is not a theocracy, and it needs to stop acting like one." "Conroy's personal biases against the nonreligious have prevented me from participating in my government," Barker says. "The judge's acquiescence in this inequity sends a crystal clear message that our government, founded upon our entirely secular Constitution, may discriminate with impunity against atheists and freethinkers." The case began when U.S. Rep. Mark Pocan, D-Wis., who represents Barker's district in Madison, Wis., requested that Barker give the opening invocation before the House. Barker is a former minister and prominent freethought author, speaker and debater, whose books include "Losing Faith in Faith: From Preacher to Atheist" and "Godless." Although the chaplain had no written requirements for guest chaplains, Conroy not only required proof of ordination, as well as representative backing, but other documentation. Barker, who retains a valid ordination, met each of the ad hoc requirements the chaplain's office invoked to bar him. After Conroy decided that Barker could not deliver the opening invocation because he lacks belief in a higher power, Barker submitted a draft of his invocation, in which he noted that he could indeed invoke a "higher power": "There is no power higher than 'We, the People of the United States." His remarks also invoked the spirit of the founding patriot Thomas Paine, who promoted "Common sense over dogma." In his legal complaint, Barker noted that from the years 2000 to 2015, 96.7 percent of all guest chaplains have been Christian, although Christians are 70.6 percent of the U.S. population; 2.7 percent were Jewish, compared to 1.9 percent of the population, and other religions were underrepresented. Fully 99.8 percent of recent invocations have been by those stemming from Abrahamic religions. No atheist or agnostic has been allowed to officially offer the opening invocation before Congress. "Shouldn't the House of Representatives — the People's House — be representative?" Barker asks. Congress spends about $800,000 a year on its opening prayers, including Chaplain Conroy's annual salary of $172,000, as well as a salary and office for the Senate chaplain. Conroy's sole duty, Barker points out, is to "offer a prayer at the commencement of each day's sitting on the House"—roughly 135 times per year—a duty that Conroy delegates to a guest chaplain approximately 40 percent of the time. For 2011, FFRF calculates that Conroy earned $1,659 per prayer. 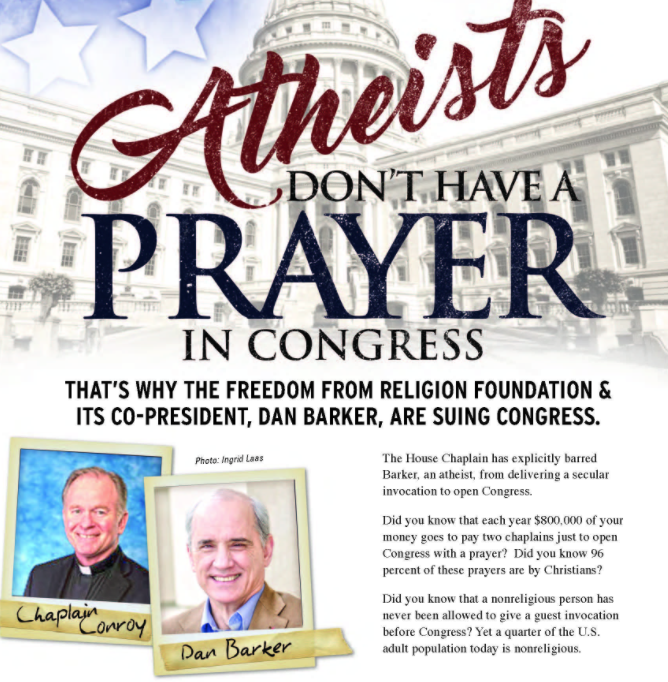 Barker is represented by FFRF Staff Attorneys Andrew L. Seidel and Sam Grover, with Richard L. Bolton serving as a consultant. Barker v. House has case number 1:16-cv -00580.